Record numbers of people are being diagnosed with cancer. But how is the NHS doing in supporting them with such devastating news? According to an analysis of data from the National Cancer Patient Experience Survey for England by Macmillan Cancer Support, the NHS is not doing as well as it should in helping patients cope with cancer. The charity warned that inadequate support risked undermining the drive for patient-centred care while causing anxiety and distress at what, for many, is the toughest time of their lives. It is not the first time this issue has cropped up. Last year, a report by Marie Curie warned poor communication during cancer treatment and end of life care was costing the NHS England in excess of £1 million per year in poor adherence to treatment, repeat visits to clinics, disputes and even litigation. It highlighted a lack of training as an issue. Workload is also likely to be a factor. Evidence shows clinical nurse specialists (CNS) play a vital role in supporting patients and their families. Previous research from Macmillan Cancer Support has shown 91% of patients assigned a CNS felt they were listened to and more able to take information on board. He says a follow-up holistic needs assessment is often the best way to ensure patients get the right support, while Macmillan and other charities can also provide help. 27% did not completely understand the explanation of what was wrong with them. 28% did not receive easy-to-understand written information about the type of cancer they have. 46% of cancer patients were not given full information about potential future side effects of treatment. RCN cancer and breast care forum chair Susanne Cruickshank agrees that the pressure on CNSs caused by 'shortages' in some places, and for some disease groups, is certainly a factor. She says the pressures in the system mean people are still being diagnosed in wards and so nurses and other staff working in these areas need to be better informed too. ‘They don’t need to wait for an expert to offer some information to the patient and the family or explain a diagnosis. They do this across many conditions currently – cancer should be no different. ‘We know that patients do not retain all the information they are given and we need to recognise this. Hence, reinforcing and revisiting information is vital. So what can be done? Mr Henry says staff should consider signing up for advanced level communication skills training. And they should familiarise themselves with guidance on breaking bad news. He also reiterates the need for follow-up consultations to be arranged with CNSs where possible to ensure the patient is ‘fully informed and understands their disease, prognosis and treatment options’. Other measures could include encouraging people to record conversations so they can listen back to what they have been told and providing patients with information that prompts questions. Meanwhile, research from University of Southhampton has suggested healthcare professionals take social factors into account when they are supporting patients. In a study of 1,000 people with bowel cancer, those living in the most deprived areas were twice as likely to have little or no confidence in managing their cancer compared with those in the most affluent places. And single patients were also twice as likely to have little or no confidence than those who were married. It is the natural inclination of health staff to try to fix things, says Nicola Schofield, one of the senior trainers at the Maguire Communication Skills Training Unit based at the Christie NHS Foundation Trust in Manchester. But she says the secret of supporting people with a cancer diagnosis is to fight that desire – at least initially. ‘Healthcare professionals are trained to problem solve so that is what they try to do. But patients need to be actively listened to, to express their concerns and have those validated. She says the key is to verbally acknowledge those concerns and empathise with the patient, but she finds people she trains are surprised to learn they are not doing this as well as they think. ‘There are many pressures for healthcare professionals. 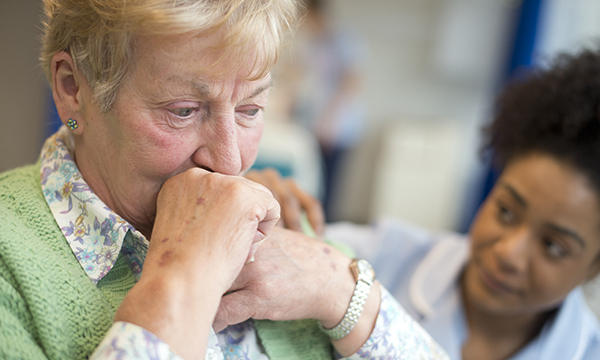 Staff may often feel they haven’t got the time to go through concerns when in reality if a patient feels heard they are able to hear and recall more of the information provided to them.’ In short, it is more effective in the long run, she says.